State recognition signifies the decision of a sovereign state to treat another entity as also being a sovereign state. Recognition can be either expressed or implied and is usually retroactive in its effects. It does not necessarily signify a desire to establish or maintain diplomatic relations. Article 3 of the Montevideo Convention declares that political statehood is independent of recognition by other states, and the state is not prohibited from defending itself. In contrast, recognition is considered a requirement for statehood by the constitutive theory of statehood. An important part of the convention was Article 11 that prohibits using military force to gain sovereignty. State practice relating to the recognition of states typically falls somewhere between the declaratory and constitutive approaches. International law does not require a state to recognise other states. Recognition is often withheld when a new state is seen as illegitimate or has come about in breach of international law. Almost universal non-recognition by the international community of Rhodesia and Northern Cyprus are good examples of this, the former only having been recognized by South Africa, and the latter only recognized by Turkey. In the case of Rhodesia, recognition was widely withheld when the white minority seized power and attempted to form a state along the lines of Apartheid South Africa, a move that the United Nations Security Council described as the creation of an "illegal racist minority régime". In the case of Northern Cyprus, recognition was withheld from a state created in Northern Cyprus. International law contains no prohibition on declarations of independence,  and the recognition of a country is a political issue. As a result, Turkish Cypriots gained "observer status" in the Parliamentary Assembly of the Council of Europe, and their representatives are elected in the Assembly of Northern Cyprus;  and Northern Cyprus became an observer member of the Organisation of Islamic Cooperation and the Economic Cooperation Organization. Most sovereign states are states de jure and de facto (i.e., they exist both in law and in reality). However, a state may be recognised only as a de jure state, in that it is recognised as being the legitimate government of a territory over which it has no actual control. [ citation needed] For example, during the Second World War, governments-in-exile of a number of continental European states continued to enjoy diplomatic relations with the Allies, notwithstanding that their countries were under Nazi occupation. [ citation needed] The PLO and Palestinian Authority claim that the State of Palestine is a sovereign state, a claim which has been recognised by most states, though the territory it claims is under the de facto control of Israel. Other entities may have de facto control over a territory but lack international recognition; these may be considered by the international community to be only de facto states. They are considered de jure states only according to their own law and by states that recognise them. For example, Somaliland is commonly considered to be such a state. 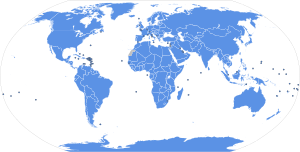 For a list of entities that wish to be universally recognised as sovereign states, but do not have complete worldwide diplomatic recognition, see the list of states with limited recognition. Generally speaking, states are durable entities, though it is possible for them to become extinguished, either through voluntary means or outside forces, such as military conquest. Violent state abolition has virtually ceased since the end of World War II. Because states are non-physical juridical entities, it has been argued their extinction cannot be due to physical force alone. Instead, the physical actions of the military must be associated with the correct social or judiciary actions in order to abolish a state. The ontological status of the state has been the subject of debate,  specially, whether or not the state, being an object that no one can see, taste, touch, or otherwise detect,  actually exists. ^ Núñez, Jorge Emilio (2013). "About the Impossibility of Absolute State Sovereignty". International Journal for the Semiotics of Law. 27 (4): 645–664. doi: 10.1007/s11196-013-9333-x. ^ Israel's Disengagement Plan: Renewing the Peace Process Archived 2 March 2007 at the Wayback Machine: "Israel will guard the perimeter of the Gaza Strip, continue to control Gaza air space, and continue to patrol the sea off the Gaza coast. ... Israel will continue to maintain its essential military presence to prevent arms smuggling along the border between the Gaza Strip and Egypt ( Philadelphi Route), until the security situation and cooperation with Egypt permit an alternative security arrangement." ^ Israel allows the PNA to execute some functions in the Palestinian territories, depending on special area classification. Israel maintains minimal interference (retaining control of borders: air,  sea beyond internal waters,   land ) in the Gaza strip and maximum in " Area C". See also Israeli-occupied territories. ^ Fazal, Tanisha M. (1 April 2004). "State Death in the International System". International Organization. 58 (2): 311–344. doi: 10.1017/S0020818304582048. ISSN 1531-5088. ^ Ringmar, Erik (1996). "On the ontological status of the state". European Journal of International Relations. 2 (4): 439–466. doi: 10.1177/1354066196002004002. ^ a b Robinson, Edward H. (2014). "A documentary theory of states and their existence as quasi-abstract entities" (PDF). Geopolitics. 19 (3): 461–489. doi: 10.1080/14650045.2014.913027. Archived from the original (PDF) on 3 March 2016. Retrieved 16 September 2014. ^ Fazal, Tanisha M.; Griffiths, Ryan D. (1 March 2014). "Membership Has Its Privileges: The Changing Benefits of Statehood". International Studies Review. 16 (1): 79–106. doi: 10.1111/misr.12099. ISSN 1468-2486.